We got our hands on the new iPad on the show and we’ll talk about our thoughts on Tuesday’s Apple education event. We also feature your comments and questions for Jason Cross, Leif Johnson, Michael Simon, Roman Loyola, and Dan Masaoka in the Macworld Podcast, episode 598. 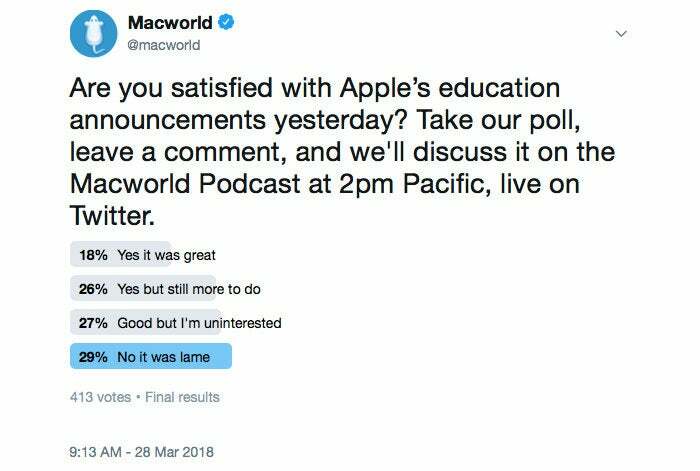 Before the show, we asked (via Twitter) if you were satisfied with Apple's announcements. Here are the results. The Macworld Podcast broadcasts live on the internet on Wednesdays at 10 a.m. Pacific. You can watch on Twitter via Periscope or on YouTube.